If you have young children then you may have heard the very popular Baby Shark song. If you haven’t, then I am sorry for ruining your life. The Baby Shark song has become very popular thanks to PinkFong. My household hears it on a daily basis, at least a dozen times a day. My youngest son is obsessed. He has become a huge shark fan because of this song. We have recently been trying to teach my son how to say more words, and we have found that by using his love for sharks we can get him to interact more. So when I found this fun little cootie catcher shark I knew I had to help him make it. We play with it all day long. He even uses it to dance to his favorite song. We have taken an idea we got from his speech therapy teacher and have used the cootie catcher to “catch” words. We take the flashcards with words and images on them that his therapist gave us and we feed them to the shark. As my son feeds the shark he says the word. This helps him articulate words and makes it fun and interactive for him. Now even if your kids don’t need speech therapy I am sure you can find other fun ways to use this fun cootie catcher. Our oldest just loves chasing her brother around with the shark and pretending its going to eat him. Which of course brings endless laughter. Be sure to check out Easy Peasy and Fun’s tutorial on how to make this fun Shark Cootie Catcher. You will love the adorable little puppet toy. This entry was posted in Activities and tagged Activities, baby shark, crafts, easy peasy and fun, free printable, paper crafts, pinkfong, shark cootie catcher, shark printable, speech, speech therapy, the boys store, therapy games, Toys on May 4, 2018 by Lacy. Fidget Spinners are all the rage right now. But what about creating your own Lego Fidget Spinner at home? All you need is a little bit of help from one of our favorite Mommy bloggers, Sarah at Frugal Fun 4 Boys. Sarah is always finding awesome ideas for her boys. We have highlighted her so much we think of her as one of our friends. She knows what boys like, and she knows how to keep them busy. Legos are such great fun for young boys, but they are also incredibly educational. So it is no surprise that she has found a way to combine them with the latest craze of Fidget Spinners. Fidget Spinners are incredibly cool and fun gadgets that boys and girls are going crazy over. Originally created to help children with ADD, ADHD, And Autism. They help busy kids stay on task while still being able to fidget, move, and act. This fun adaptation in Lego form is so neat and so creative we just had to share it. Lego Fidget Spinners are great for any age and any child. Feel free to share with all of your friends. Head on over to Frugal Fun 4 Boys to get the full tutorial, and make sure you have a good supply of Legos for the materials needed. Then enjoy your little spinner all day long! This entry was posted in Activities and tagged Activities, craft, DIY, fidget spinners, frugalfun4boys, lego, make at home, spinners, the boys store, Toys on May 16, 2017 by Lacy. My kids love Legos. Therefore, we spend probably 85% of our time indoors building legos. So when a friend recommended these toys I knew I had to check them out. 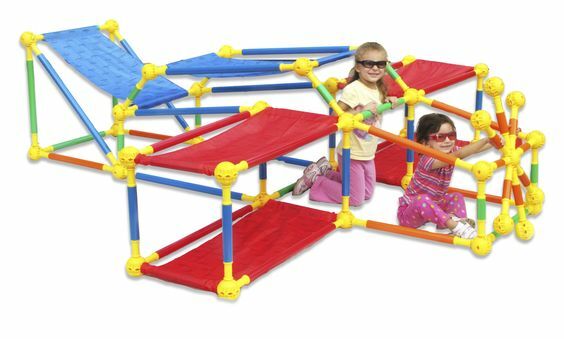 Toobeez are like oversized K’nex toys. Like Legos they teaching critical thinking, spatial understanding, nurture creativity and working together. Toobeez comes in sets of 50 or 150. Toobeez consists of long, medium, and small poles that connect with ball joints. Also, you can put sheets, or cloth coverings on them (each set comes with a few) to create tents, forts, etc. We purchased one set and were gifted another set. Since then my kids have been in building mode for days. We have already perfected the fort, and we have fallen in love with the airplane. My daughter, who’s current obsession is Moana, did find a way to create a sailboat. The building possibilities are endless. Kids can create and build all day long. It is fairly simple to begin, and the more you do it the adept you get at putting the pieces together and taking them apart. 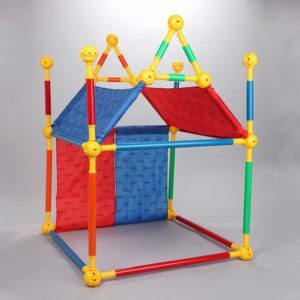 Check out Toobeez for a fun building alternative, and be sure to see some of the interesting building ideas. Also, you can look Toobeez up on Pinterest for dozens of building ideas. This entry was posted in Activities, Shopping and tagged Activities, building, building toys, construction toys, creating, fun, learning, legos, the boys store, toobeez, Toys on April 4, 2017 by Lacy.